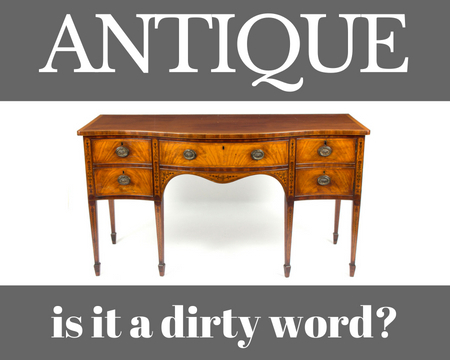 Is antique a dirty word? While imitation may be the sincerest form of flattery, it’s time for the antiques industry to close ranks against the wannabees, writes antiques dealer Edd Thomas, asking is antique a dirty word. Like any 21st-century human I spend a good chunk of my time shopping or browsing, albeit with an antique-related filter. However, whether I am wandering around a store, browsing online or looking for bargains at a fair, a little thought niggles in the back of my head. With the antiques trade going through some tough and confusing years, is it time for a rebrand? As any good image consultant would tell you (for a hefty fee of course) a clear and well-defined brand is crucial to maintain and grow your customer base. But as the range of items being sold under the ‘antiques’ banner has shifted, are we unintentionally confusing everyone? And are we being protective, and proactive, enough with our own precious terminology? Words do matter. It is a fact I was reminded of recently when I discovered that some TV production companies today actively avoid the word ‘antique’ because they consider it outdated. It is the same reason some auction houses have turned to more current words, such as ‘decorative’ or ‘interiors’, to promote their sales. But, while it is tempting to leapfrog onto the latest buzzwords, we may be better off redefining the ones we already own. Who has not entered a shop, auction or fair clearly emblazoned with the word ‘antique’ above the entrance, only to find the vast majority of the contents are newer than the food in our fridge? From outright knock-offs, (under-labelled so the customer won’t realise they’re fake) to ‘weathered’ garden ornaments and ‘vintage’ furniture, with the paint barely dry, it seems the new definition of antique includes some rather modern pieces. In essence, I don’t have an issue with modern items being sold alongside old ones, as long as some clarity is put in place. I also understand that, in lean times, it takes creativity to survive. But while it helps the seller in the short term, I’m not convinced it helps us as an industry in the long term. The more the term is abused, the more the consumer grows sceptical, which damages the overall brand. As we know, the fashion industry among many others, spends untold energy protecting itself from fakes. Not because the knock-offs are unworthy of use, but because the consumer’s trust in a brand is paramount. It is also not just the ‘antique’ category that has been affected. As consumers’ tastes shift to more modern eras, the same branding issue is occurring among ‘vintage’ and ‘retro’. The other day I was flicking through the catalogue of a famous homeware store and was struck by the percentage of blatant copies of vintage and antique objects. I’m not talking about the true design icons, which are protected by designer resale rights, but style accents. From worn vintage leather club chairs, to Victorian pine kitchen tables, a range of styles was on offer, most of which was woefully mislabeled. As the marketing team had been fully aware, terms such as ‘vintage’ and ‘vintage style’ conjure up memories of cosy nostalgia, simply by the addition of a label. In some sense I think the confusion began many years ago, probably when new limited-edition items started to appear on the shelves beside genuine antiques. Savvy producers were keen to ally themselves with the ‘antique’ brand, known to offer both quality and sound investment potential. For reasons I can never fully fathom, we all got very excited by collecting these ‘limited editions’ (as if we were back in the playground collecting chewing gum cards). But it opened a Pandora’s box for what the ‘antiques’ label could then include. Today, as a plethora of distinctly non-antique items seems to fall under the antiques banner, you could argue that the word itself has lost its own seal of approval. To sum up, if we produced a certain sparkling wine, or cheese, or pork pies, we would be actively defending our name and dignity against a sea of alternatives. As the antiques trade faces ever-tougher competition from producers of new or fake items (who will always win in terms of price and availability), it is perhaps time to refocus our energy on reminding people what is an antique, and what is not?